“The economy is weak, and this is no time to raise rates,” asserts Jim Rickards. That’s nothing new if you’ve been reading our virtual pages this year. But Jim — never in step with conventional wisdom to begin with — is standing more and more alone. Yesterday, the Federal Reserve released the minutes of its October meeting. They reinforced conventional wisdom that a rate increase at the next meeting on Dec. 16 is all but a sure thing. Stocks, already up sharply on the day, drifted up some more. The Dow ended the day up nearly 250 points. “We use a unique method different than Wall Street’s to forecast and invest in markets,” says Jim — expanding on our discussion yesterday of his “Kissinger Cross” tool. “The problem with Wall Street economists is they would rather be wrong in a herd than right on their own. “If they stick with the consensus forecast, even if they’re wrong, they can shrug and say, ‘Everybody else thought the same thing,’ and just move on. If they try to lean forward to help investors and they occasionally get things wrong (everybody does sometimes), the limb could be chopped off behind them and they’ll lose their jobs. So it’s better to be safe in the crowd. “This is the same logic found in the animal kingdom. Wildebeests have a herd mentality when stampeding away from a lion. The lion will kill and devour a solo member of a wildebeest herd. But if wildebeests stick with the main herd, they will probably survive. 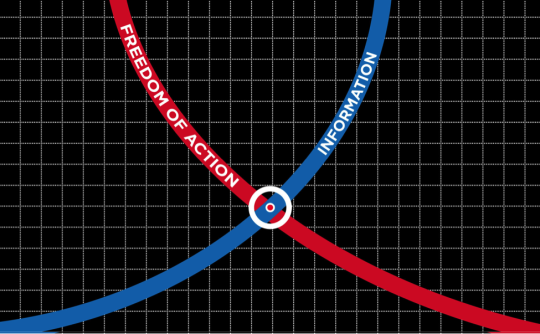 Here again, Jim’s talking about that sweet spot between having the right information to act on… and enough time to act effectively. By using the Kissinger Cross, “we don’t run with the herd,” says Jim. “We also avoid the lion. The lion devours the member of the herd who falls behind. We avoid the consensus and the lion by staying ahead of the herd. No, this won’t be on the test — heh. “In other words, you start with a thesis about how the economy is functioning and what this means for you as an investor,” Jim goes on. “Then you challenge your thesis every day with incoming information. So the thesis is what’s on the left side of the equation. The numerator on the right side — the top part of the fraction — is new incoming information. And the denominator represents all of the possibilities you might be wrong. “As confirming information comes in, it’s added to the numerator and the fraction approaches 100%,” Jim says. “That makes your thesis extremely powerful. If contrary information comes in, the fraction shrinks and your thesis may have to be abandoned. “Right now our main thesis is that a global recession is already here,” Jim goes on. Maybe not the “technical” definition of a recession — but a meaningful slowdown in growth that feels much the same. 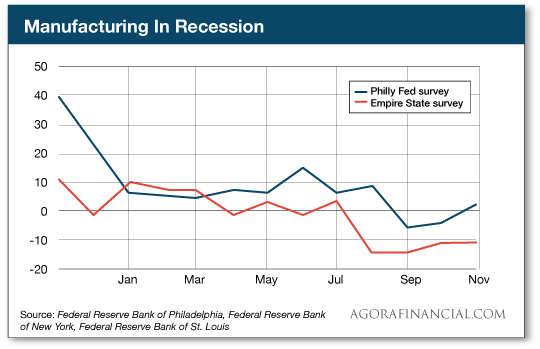 The Fed’s Empire State Manufacturing Survey registered deep in negative territory — weaker than anyone expected among in the herd of economists surveyed by Bloomberg. 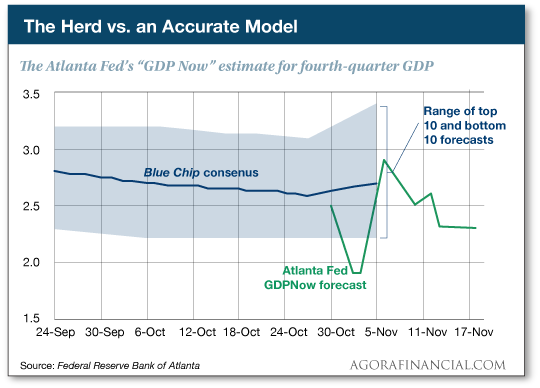 But here’s the most powerful bit of incoming data Jim can point us to: the “GDPNow” chart from the Federal Reserve Bank of Atlanta — an ongoing forecast GDP in the current quarter. And it’s confirmation of what the Kissinger Cross already indicated, getting back to where today’s episode of The 5 began: “The economy is weak, and this is no time to raise rates. “If the Fed raises rates in December anyway, it’s a kamikaze mission that will sink the economy even faster than it’s already sinking. Jim and his team laid on a Kissinger Cross trade recommendation two days ago. It’s still in play. It has the potential to triple your money by the end of next year. And there are three other Kissinger Crosses that just flashed green as well. of the Kissinger Cross tool from Jim. The big U.S. stock indexes are flat after their big run-up yesterday. At last check, the Dow rests at 17,756. The S&P 500 is perched at 2,084 — 50 points off its all-time high notched on May 21. Bonds are rallying, the yield on the 10-year Treasury now 2.24%. Ditto for gold, up more than 1% as we write, at $1,082. Crude continues to oscillate around $40. 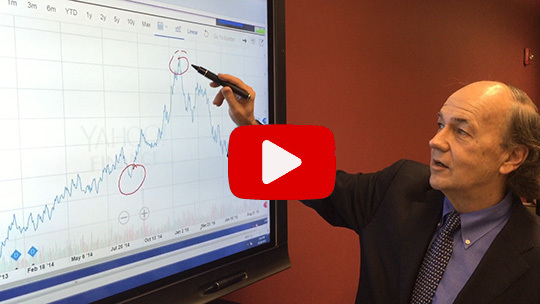 “It’s open season on unicorns,” says Greg Guenthner of our trading desk. If you’re not hip to the language of Silicon Valley, “unicorns” are tech startups that have achieved a $1 billion valuation via venture capital and private equity. Snapchat and Airbnb are prime examples, along with Uber — now valued north of $50 billion. But it’s not working out: Yesterday, the dating site Match went public “at the low end of the company’s projected range,” says the Financial Times. Square, a maker of mobile credit card readers, priced its IPO at $9 — well below its projection of $11-13. This morning, the lemmings are piling into both — especially Square, which has zoomed up 44% as we write, to nearly $13. We’ve said it for two years now: The best time to get into an IPO is before it goes public. And believe it or not, it’s possible for you, the retail investor, to do just that. The “antibiotic apocalypse,” scientists are calling it: Researchers in China have identified bacteria that are resistant even to the drugs that are used when all other treatments have failed. Both people and livestock in southern China have been infected. Readers of Breakthrough Technology Alert took some gains off the table earlier this year… and they’ve had a wild ride with the position they’ve held onto. But in his year-end portfolio review, Stephen says that at current prices, it’s a buy. Who says there’s no inflation in food prices? McDonald’s is killing the last vestiges of its Dollar Menu. In 2013, after more than a decade, Mickey D’s switched up the Dollar Menu to the “Dollar Menu & More,” featuring items costing as much as $2. It was a long time coming: Even before the “Great Recession” hit, franchisees complained a $1 double cheeseburger was wrecking demand for more expensive items and killing their margins. Come January, even the faux Dollar Menu will be no more — replaced by something called the “McPick 2.” You can buy any of two items from a menu of four — the McChicken, the McDouble, small fries and mozzarella sticks — for $2. Can’t all be the “Amazon effect” either: After all, RadioShack is toast now. Where else are you going to go but Best Buy if you want to overpay for an HDMI cable? Our point is the one we were making above: The Wall Street herd thinks the recent job numbers make a December rate increase a sure thing… while “a flood of more recent data points in the direction of a global recession,” says Jim Rickards. You can exploit that mismatch for fast gains using Jim’s unique “Kissinger Cross” tool — which he explains for you right here.